By the end of 2014, Batman will have a Robin again -- although who it will be in the role isn't yet clear. A new one-shot by Peter J. Tomasi will usher in a new status quo for Batman's sidekick, and then Tomasi's Batman and... book will resume with its original title, Batman and Robin. The Los Angeles Times's Hero Complex blog reports that the one-shot "by Tomasi and artist Andy Kubert will follow up the current “Hunt for Robin” storyline, with the struggle between Batman and Ra’s al Ghul becoming something bigger with the involvement of forces from Darkseid’s world, Apokolips. The two obvious candidates would have to be Tim Drake and Damian Wayne. A new Robin isn't technically outside of the realm of possibility, but "bringing back" seems to put lie to that theory. Drake, currently operational as Red Robin, has supposedly never been Robin in the New 52. That doesn't stop his traditional Robin costume appearing on a new promotional image for the weekly event series The New 52: Futures End. Damian is technically dead, but with a grandfather who curates a bunch of Lazarus Pits and a father who's been in and out of death's door a few times, that seems like a small matter. Ever since he first died, there have been rumors and speculation that Batman's son would return. That the cover of the Robin Rises: Omega one-shot features a child in a coffin seemingly points fans in the direction of "this is a Damian story," certainly. But, again, the writer is staying mum. "Let’s just say that we are most definitely bringing back a Robin for Batman’s 75th anniversary. Batman needs a Robin and Robin needs a Batman," said Tomasi, adding when pressed about the story possibilities of a Damian resurrection that "Weeeeelllll, you’re making a biiiiggg assumption that it’s Damian that comes back from the dead, and in a general note I’d say that anyone coming back from the dead, be it comics or in real life, would most likely result in some changes that no one expected." 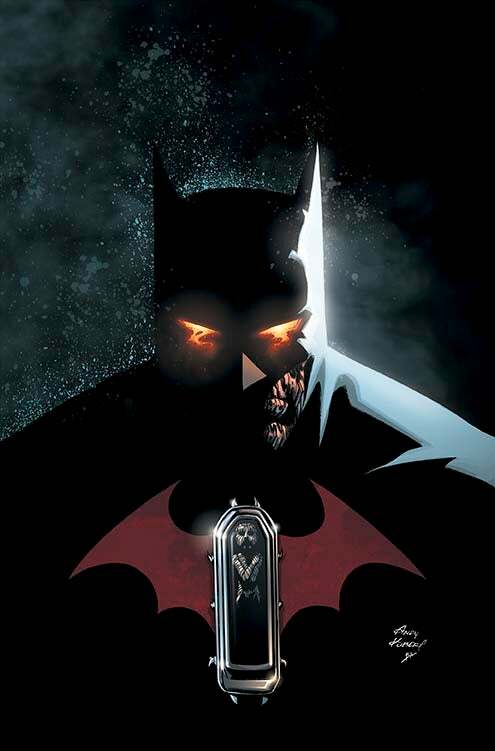 The one-shot, titled Robin Rises: Omega, will hit the stands on July 16. Son of Batman, a movie adaptation of Damian Wayne's earliest appearances, comes to DVD and Blu-ray on May 6.